Please use the twist-drill engine speed at 5000 rpm or less. I used it for chamfering the wooden dish screws but it was possible to use it although the diameter was barely visible. I wanted something a little bigger. This review is about item#9166726. I use it for the counter sink of the screw. The cheap products made in China will collapse soon. There is not quite a product called this. Although it only has wood for a while, this is equivalent to the price. This review is about item#9166692. Although it was used with aluminum plate, it scarcely scraped. Looking at the slightly scraped processed surface, it is strangely slippery, and the blade is obviously slipping. This review is about item#9166701. Since it is a hexagonal axis it is better to use impact. However, it is saved if there is a size about 10 mm larger. The finish is clean and it is the second purchase. This review is about item#09166717. 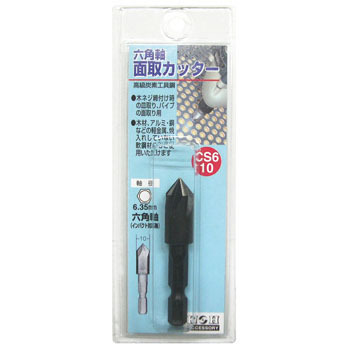 It is an easy-to-use item that is phytolized even on electric drawn hand held by adoption of hexagon bit. You can conveniently use it at any time as long as it is in one corner of the tool box. This review is about item#09166683. Regardless of MDF, teeth do not stand at all with fiber wood and aluminum. Can not be scraped. This review is about item#09166692. It can not cut even if it is used for wood or plastic, can not be used, can not be used.